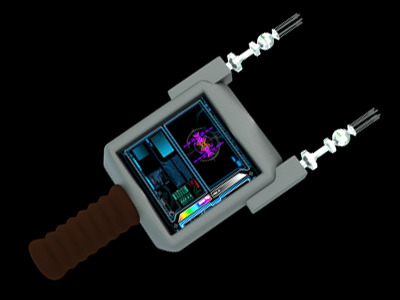 The Biological Sensor Pack (BSP) is the counterpart to the Energy Sensor Pack. Limits in technology at the time prohibited the creation of a combined, portable unit that could provide focused scanning capabilities for both biological and non-biological entities. Instead, each type of sensor unit was separated, reduced to the core components, and then readied for production as a portable unit. The BSP uses a set of sophisticated sensors that detect the essential elements and chemicals present in most all life forms. Much like the Energy Sensor Pack, the sensors on the BSP are not inhibited by metal alloys. As such a focused scan on an entity will reveal all biological presences within.